Bloody hell, this film nearly killed me. It is amazing, absolutely amazing, but awful, absolutely awful. Why do only bad things happen? Why indeed? Skunk is eleven and lives in North London with her father, brother and au pair. Things are pretty good. She’s on school holidays and spends her days hanging out and being a kid. Then really bad stuff starts happening all over the place. I can’t recount it, as I think I am too traumatised. But it was stunning. The performances are fabulous on all counts, from Tim Roth and Cellian Murphy right down to the kooky twins on the scooters. Eloise Laurence is absolutely amazing as Skunk, and I cannot wait to see what she does in the future. 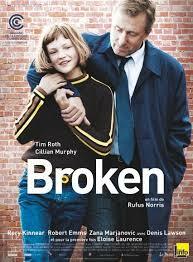 If you don’t mind being mentally bashed by a film, I’d highly recommend Broken. Apart from all of the awful things, it is gorgeous and funny and really sweet.